In today’s economy people are thinking less about buying their “dream home” than they are about modifying their existing house to be their “dream home”. Homeowners are updating their kitchens, renovating their bathrooms, replacing old linoleum floors with lavish hardwood or elegant tile and transforming their once modest dwelling into the home of their dreams. One of the most common – and luxurious – yet, practical upgrades is the addition of radiant heat. In this unprecedented era of energy awareness, radiant floor heating systems have proven to be extremely efficient; hence increasingly popular. But it’s not just the efficiency of these systems that have homeowners abuzz. Radiant heated floors provide luxurious, comfortable warmth that truly needs to be experienced to be appreciated. You don’t need to tear out your current floors to install radiant floor heat. 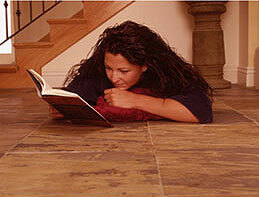 Many homeowners have been pleasantly surprised to discover that they can heat their existing floors. If you can access the floor joists from below, you can install either the RetroHeat floor heating system or the low-voltage FloorHeat product. Both of these systems rank among the best when it comes to performance and ease of installation. If you are thinking about replacing your old floor with tile, hardwood or new laminate, then don’t pass up this opportunity to install a radiant floor heating system. ComfortTile is an exceptional floor heating system that is the most highly recommended for heating tile floors. The heating cable is available on spools or in mats. ComfortTile mats feature heat cable that is attached to an adhesive-backed fiberglass mesh and can be rolled out like a sleeping bag and secured to the floor, making the cable installation quick and easy. The mats are compatible with all standard sub-flooring materials and have a low 3/16-inch (3 mm) profile, making this an excellent system for renovations. ComfortTile heat cable on the spool allows more flexibility in terms of heating odd, custom-shaped rooms. The cable is “serpentined” across the floor and attached to the subfloor with the use of thin, malleable steel strapping (supplied with the system). 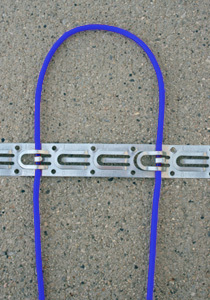 The straps have tabs that fold down over the cable so you can accurately space the heating element.